The latest issue of Paul Scott's annual Omnivistascope has been released. "Model VI" is dedicated to the memory of Patrick McGoohan and features an article by Ed Berridge on the real life inspiration for The Prisoner's Village. The cover by Paul McCaffrey, of a human astronaut finding a desolate Martian Tripod on the surface of Mars, is inspired by the article by Jeremy Briggs on Orson Welles' radio version of The War Of The Worlds. However the main reason for buying OmniVistaScope is for the comic strips, mainly written by Paul Scott. The robot Rathbone returns in the forth part of 'The Last Of The Organic Wars' with art by Brian Coyle, Dirk Despair returns in 'Conservatoire De La Mort Et De Paranoia' with art by Chris Geary, while Keenan Jask is back with art by Leigh Shepard. 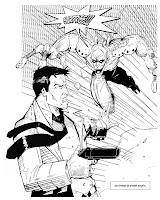 Paul Scott also continues to affectionately send up the photo stories of early new Eagle comic with two stories of his consulting magician Warlock Holmes (and the Amazing Dr Wizard TM). Omnivistascope Model 6 is a 100+ page, perfect bound A4 book with colour cover by Paul McCaffrey and monochrome interiors. Cost including UK postage is £6 and it is available via Paypal on the Omnivistascope website. More details of Omnivistascope are on the OVS Facebook page. The Ink-dot/Howies ESCAPE Exhibition, featuring a series of beautiful new limited edition prints by more than 30 of today's best illustrators, animators, designers (and one lowly comic book scribbler, Lorenzo Etherington) opens in Bristol later this month. It's a show the Etherington Brothers - whose work includes The DFC, Star Wars and Transformers, tell us is set to turn your eyeballs to mush! The exhibition opens on Thursday 17th June from 7.00pm at the Howies Gallery on Queens Road, Bristol. The show will run for two weeks, but the opening evening is the killer - the last one had queues outside all night, and was the gallery had ever hosted. Those who saw/picked up a copy of Lorenzo's ace Stranski print from the previous show will be pleased to hear that once again the art is being reproduced as high definition giclee prints on beautiful 315gsm 100% cotton, acid and bleach free archival quality paper. Get your art appreciation face set to stun and join them for some fun. A new Asterix book always attracts plenty of interest across Europe and we're sure Secrets de druides, released this week in French, will prove no exception. Just think about it: Dubbelosix, the spy-druid working for Caesar, has taken it upon himself to reveal the source of the most wonderful druidical marvels by publishing a mysterious book of magic spells stolen from ancient archives. 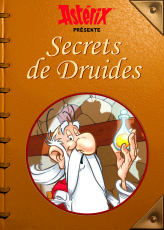 For the very first time, Secrets de druides will explain everything you wanted to know about the magic potions in Asterix’s Adventures but never dared to ask. • Prepare for D Day by visiting the druidical version of the Virtual Village, Asterix.com. A special banner on the homepage presents Secrets de druides. And, even better, a special mini-site invites you to discover the most illustrious druids, as well as several pages from the new book and original wallpapers in “Panoramix” format. 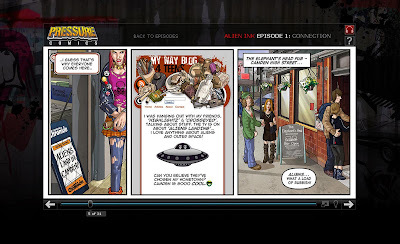 Channel 4 Education recently launched Alien Ink, an online graphic novel for teens. Written and illustrated by the team at Pulp Theatre, publishers of the hard-hitting cult hit graphic novel Brodie’s Law, Alien Ink aims to reflect a series of teen pressures, including relationship issues, sexual health and drug use. Alien Ink is the first title to be published under the umbrella of Pressure Comics, set up to produce graphic novels to tackle issues in teen life. downthetubes: How did you come up with the story - or was this a project instigated by Channel 4, who then sought out Pulp Theatre? Esther Bircham: Pulp Theatre came up with the complete story concept and characters. 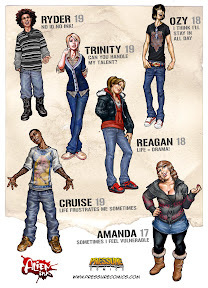 We worked with Channel 4 who provided the brief that they wanted a comic geared around teens. Pulp Theatre and Channel 4 brainstormed together before Channel 4 were happy to proceed. downthetubes: Is this the first time Alien Ink has been published? Esther: Yes, this is a completely new concept. We are still fine tuning the artwork, as the comic is being produced. downthetubes: This is a pretty exciting project and a major platform for comics given Channel 4's involvement. Are you planning anything else at this stage? Esther: Yes, we are planning to launch the graphic novel offline - with the popularity of Alien Ink there are many opportunities we can explore – really the sky’s the limit. downthetubes: Will there be a TV tie-in or is this purely an online play? 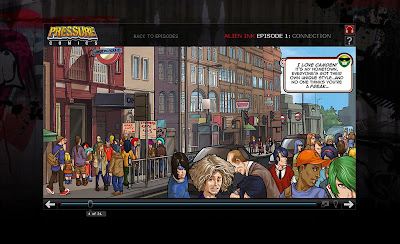 Esther: At present there are no TV tie-ins – Alien Ink is purely dedicated to online play. downthetubes: David Bircham is the artist on this project. Can you bring us up to speed on his many projects? Esther: David has been drawing comics for over 20 years. His career started with 2000AD, when he drew characters such as Judge Dredd, Slaine and various others. David met Daley Osiyemi a graphic designer for the likes of Saatchi and Saatchi amongst others and together they started Pulp Theatre. Esther: We are fans of British and US comic book artists such as Simon Bisley, Alan Moore, Alan Grant, Jim Lee, Chris Bachalo, Frank Miller and Travis Charest. downthetubes: What’s the most challenging thing about working on Alien Ink? Esther: Balancing the needs of Channel 4 as well as providing the edginess to satisfy the audience. downthetubes: And what’s the best part about working on this project? Esther: The potential to reach a worldwide audience and to be the first comic book publisher to work with a major UK broadcaster on an online graphic novel project. Esther: We have learnt success depends on the quality of the product and success always means great sacrifice. It’s an old lesson but definitely one worth remembering. downthetubes: What's next for the strip — and Pulp Theatre? Esther: We have various plans which will unfold naturally – stay tuned to Pulp Theatre and we will make sure you’re the first to know. Special thanks to Esther for taking time out of a busy schedule to answer our questions. Readers can interact with the comic via Facebook, Twitter, MySpace, quiz apps, YouTube (in a partially animated format) and the Pressure blog, and are encouraged to get involved in the Alien Ink world, discussing the issues raised or by submitting examples of their own creativity, be it artwork, graphic design, writing, poetry, or even their own tattoo design. 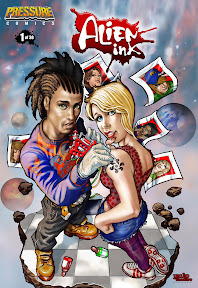 • More about Alien Ink on the official website www.alienink.co.uk, which includes links to all the various social network extensions of the project. Just a quick 'heads-up' to advise you to tune into tonight's The Culture Show on BB2 (at 7.00pm, repeated at 12.20am Friday morning). The programme will be exploring "the past, present and post-election future of British comic art" which is the focus of a new exhibition, Rude Britannia: British Comic Art at the Tate which opens on 9th June. And if that's not enough to persuade fans of all things cult to tune in, they're also be a Noel Clarke interview (that's Mickey from Doctor Who) in which the writer, actor and director will be discussing his latest film, 4,3,2,1. Put together with some the country’s best-known cartoonists and comedy writers, Rude Britannia: British Comic Art at the Tate explores British comic art from the 1600s to the present day and the exhibition also includes a number of special events, detailed on its dedicated web site. Bringing together a wide array of paintings, sculptures, film and photography, as well as graphic art and comic books, the exhibition celebrates a rich history of cartooning and visual jokes. The room on the Absurd is curated by comedian Harry Hill, and includes such diverse materials as Alice in Wonderland illustrations, David Shrigley’s sculpture, and films by Edwina Ashton and Oliver Michaels. Within the Bawdy, Donald McGill’s 'smutty' seaside postcards, can be seen with works by artists as different as Aubrey Beardsley, Sarah Lucas, and Grayson Perry. The rooms exploring Politics, Social Satire and Cruikshank's Victorian masterpiece The Worship of Bacchus, have been put together with Gerald Scarfe, Steve Bell, and the cartoonists from Viz. These show the power of comic art as a form of social and political commentary throughout history, from satires of Georgian society by Rowlandson and Gillray to Spitting Image's damning Thatcher puppet. 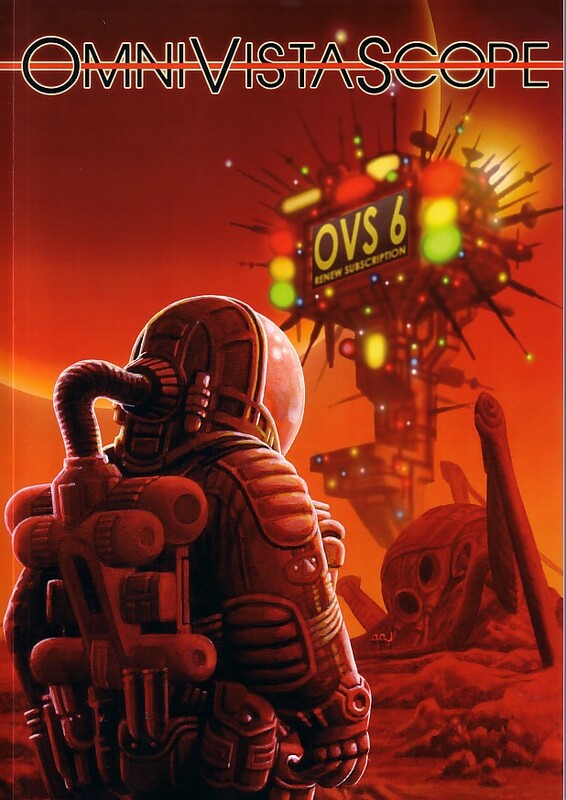 The Comic: SF-inspired comics anthology featuring the work of Kev Harper, Number Six, David Walker, T. Bye, Sharon Irvine and Drip Tray. The aim of publishing Scheme is to showcase the best unknown artists working out of the city of Glasgow, and the best way to make sure the work reaches as many people as possible is to give away each issue for free. The Review: Sometimes, you just have to despair of the mainstream British comics industry. What are the combined talents featured in Scheme Comix doing at its periphery, putting out this energized A5 anthology of science fiction inspired tales? Why aren't there more openings for such creators here in the UK for them to be given space? I feel the same way when I pick up titles like Futurequake, Zarjaz and Spandex; or I get sent advance copies of the great-looking titles like Scar Comics superb Madam Samurai. We have such a huge, homegrown range of talent that simply isn't getting the exposure it fully deserves. 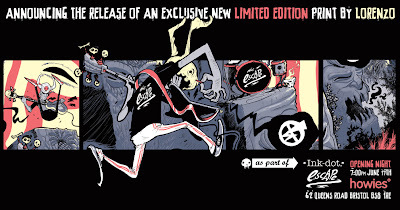 It's to the credit of Kev Harper and team that like many other creators they've risen above this sad state of affairs and put out Scheme Comix, showing off some impressive Glasgow-based art talents throughout, even if the actual stories are, inevitably for an anthology, something of a mixed bag. (Script wise, while I'm not so keen on the art, 'Break on Through' is the best written, for me, although there's a line about love in 'Tijuana Bible' that just bursts with hope). Overall, it's a great promo for some local talents and if you can track down a copy, which shows huge promise. The A5 format of Scheme Comix #1 also doesn't do the art justice: perhaps the team will reconsider this decision before putting out the next issue (it wouldn't be the first time a fanzine has changed formats during its run). Helped by funding from Arts Trust Scotland, Kev and team have put together a terrific package of strips, one of the best we've been sent in recent months from the indie press. I may have some gripes about format and not every strip works, but this is a package from a team of creators that fully deserve wider exposure and acclaim. Check them out. • Scheme Comix #1 (price: £2) is available to buy at Aye-Aye Books (CCA) and the Monorail Music record shop, Glasgow and Deadhead Comics, Edinburgh. D-Day, Normandy, June 1944 — and tank commander Joe Gibson is raring to go. 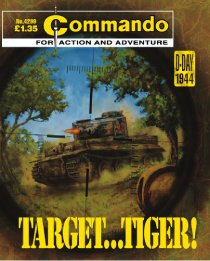 Then a Tiger destroys his Cromwell killing his crewmates. He blames himself for their deaths. Joe soon returns to duty but soon in an inferior, in his mind, M4 Sherman. To his new crew it looks like Joe has lost his nerve. They were simply supposed to showcase some new nine-pounder field pieces. But in 1861, Austrian artillery Lieutenant Stefan Kircher and his battalion of gunners found themselves caught in the thick of the American Civil War. And fighting on the side of the Confederate South against the Union. They couldn’t know then that the day of victory would come in May, 1945, but they did know that only the lucky ones would survive the war. Brothers Rory and Hamish McLean, fighter pilots, would push their luck to the limit... and beyond! This is Part five of Commando's seven-part series celebrating the end of the war in Europe in 1945. This time an air story with illustrations by two experts in the field. VE Day, May, 1945. For Wehrmacht Major Franz Thomas, a day that hadn’t come soon enough to save many lives... and he was sure it was his fault! Part six of the seven-part VE-Day series. The story is seen from the point of view of a German — something Commando has done many times over the years. The one thing that really hits you about the MCM Expo at London's ExCel centre is its sheer size. The two big comics events in the UK are Bristol and BICS. Two weekends ago Bristol had 1000 people at it - last weekend the London Movie Comic Media Exposition had over 41,000 people through the doors over its two days. 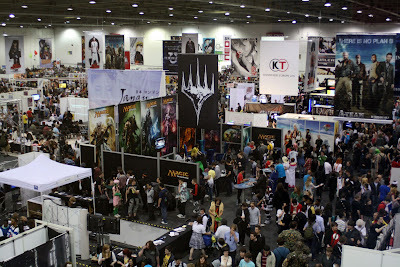 But then it isn't a comics convention, is considerably more. There have always been film, TV and comics collectors marts or fairs around the country and since the 1990s some of these have grown into the super-fairs of which Memorabilia is perhaps the best known. These were, and continue to be, enormous gatherings of dealers selling books, comics, graphic novels, toys, models, photos, posters, DVDs, cards, autographs and more. The early super-fairs started to add a few actor signings to the mix as a draw to get more people through their doors and eventually started to get them to do short Q&A sessions as well. This has turned these kind of events into more of a half-way house between a sales mart and the kind of company run, TV series based, conventions that have taken over in recent years from the old style fan run TV cons. With the decline of Star Trek fandom and the rise of Star Wars fandom as the various Trek TV series petered out and the new Star Wars movies appeared, people dressed as Klingons gave way to people dressed as Stormtroopers, while the rise of Anime and Manga produced many more colourful and increasingly bizarre characters for the costumers to emulate and a new word, "cosplay", to describe what they do. As computer games got away from their 'bloke in a bedroom' image onto the increasingly large TV sets in family living rooms, the crossover with the gaming world increased, while the success of new Doctor Who brought SF and fantasy series back into the mainstream of television. The MCM Expo drags all these seemingly disparate, but actually interrelated, themes together into one very large hall in London. With such a wide variety of interests bringing in so many fans willing to spend a lot of money, it isn't surprising that the more traditional comics community wanted a piece that action as well and the Expos, not just in London but elsewhere in the country as well, have begun to add a themed comics section to their events. While it may still seem more dominated by manga than a more typical British comics convention, the Comics Village area at Expo, organised by artist/writer Emma Vieceli, is growing into something that demands more attention than it often seems to get in the comics press. With big name guests such as Warren Ellis, Tony Lee and Ben Templesmith scheduled to attend, as well as a multitude of small pressers, last weekend's Expo had a wide selection of British comics talent who were being presented to a larger and more diverse audience than would attend any normal comics convention or mart. The overwhelming impression on getting off the DLR train on the warm and sunny Sunday morning was of the cosplayers milling around outside the venue - meeting up, chatting and unashamedly posing for photos anytime a camera was pointed in their direction. There were certainly a lot of cosplayers there with perhaps upwards of a quarter of attendees in some form of outfit. Remembering that there were in the region of 20,000 people per day that would mean upwards of 5,000 people in costume, and the standard was high. While there were Stormtroopers, Stargate uniforms, a few Starfleet uniforms, Hogwarts pupils, various incarnations of the Doctor, Marvel and DC superheroes, and even two Lego mini-figs, the vast majority were manga and anime creations ranging from the enormous to the skimpy, from the pretty to the bizarre. Of all the costumes there however my favourite had to be the Empress Dalek who managed to combine the classiness of the best anime/manga costumes with something that virtually everyone at the event would recognise. Inside the hall the majority of the sales tables were, like the cosplayers, also dominated by manga and anime. However there were sections for computer games, both single and multi-player, trading card games, an American wrestling ring(! ), A-Team and Scooby-Doo Mystery Machine vans, plus a nice K-9, a smallish TARDIS and a rather poor Dalek for fans to get their photos taken beside. One large corner took in the main stage with plenty of chairs and an impressive audio visual suite where the main panels and the live Japanese pop music took place. After various people from Caprica, Fringe and BBC's Merlin on the Saturday, Sunday also saw the team from BBC3's medical horror Pulse including writer Paul Cornell (above) and Stargate Universe's Alaina Huffman (medic TJ) and the irrepressible Jamil Walker Smith (Sgt Greer) plus SG1's David DeLuise (below). With the main theatre only divided off from the main hall by black curtains, the panels were often affected by the noise outside and while the SG:U panel went well, the Pulse panel suffered from the amount of noise from the wrestling ring which unfortunately drowned out much of what was said being. The far corner of the hall held the Comic Village with artists, publishers and small pressers mixed together in well laid out rows with their own stage for talks and discussions to take place. ... and familiar faces such as Sarah McIntyre, Lauren O'Farrell and Gary Northfield of The Fleece Station. The table rates were low enough that small pressers were able to attend and show off their wares to a much larger audience than normal, such as John Maybury and partner Siobhan Hillman on the Space Babe 113 table, which has deservedly been Eagle Award nominated for the best British black and white comicbook. Also there were artist Al Davison and writer Tony Lee showing off the collected edition of their ongoing American IDW Doctor Who comic which has been nominated in three different Eagle categories. Steve Tanner of Time Bomb Comics was also there and who, as well as selling his titles, was proudly showing off his new daughter Sasha who was attending her second convention in two weeks having been in Bristol the week before and who, remarkably, was sleeping through the noise and chaos around her in the Expo hall. Asking Steve about how his non-manga titles were selling to an overwhelmingly manga crowd, he said that he was delighted with his sales and that he had sold more at Expo in one day than at Bristol in two. Perhaps his increase in sales was down to the sheer number of people attending the Expo. Coupled the number of attendees to the mix of tables in the Comic Village and the table cost, this certainly appears to be an event that more comics creators should be taking a look at attending. For the comics fan the draw may not be as much as for a Bristol or BICS, but MCM Expo is such a vibrant celebration of popular culture that it makes for an event that is worth experiencing at least once. The next London MCM Expo is at ExCel London on 30/31 October 2010. More details are available at the MCM Expo website. Doctor Who graphic novels range cancelled? Speculation is rife on the future of Panini's Doctor Who comics collections today, after news broke that the planned release of The Crimson Hand - featuring Tenth Doctor David Tennant's last comics adventures - had been cancelled. Sheffield based store Galaxy 4 was among the first retailers to break news to customers that the collection had been postponed due to "contractual difficulties", prompting fans to wonder if the entire series - including an expected collection of Seventh Doctor stories - had also been cancelled. Some even speculated that comic strip was being dropped entirely from Doctor Who Magazine. Doctor Who Magazine editor Tom Spilsbury has told fans he is unable to comment at this time on the fate of the range, but he did tell downthetubes the difficulties for this collection "shouldn’t affect us carrying on the regular strip in DWM". Comic strip has long been a staple of Doctor Who with the BBC featuring new stories in Doctor Who Adventures - a title which has seen declining sales in recent months, detailed in recent ABC audited sales figures and on the BBC web site - and Doctor Who Magazine. IDW publishes Doctor Who strip in the US that is widely available in the UK through what is known as "grey" importing, and online piracy. 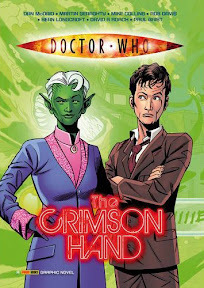 The Crimson Hand is planned as the third and final volume of comic strips collecting the Tenth Doctor's complete adventures as seen in the pages of Doctor Who Magazine, as the Time Lord joins forces with Ms Majenta Pryce and embarks on his most remarkable series of journeys yet. Let's hope the delay is just a temporary set back, as the collection features some of the best ever Doctor Who stories in recent years. Commenting on Doctor Who Adventures, Jaynie Bye, joint MD of BBC Children's Magazines and publisher of Match of the Day acknowledged the now weekly title's sales during the last sixth months of 2009 - the latest audit period - were down year on year, but said this was "as anticipated", noting it was still performing well given the absence of the show from the schedules for most of this period. "We are confident that circulation will increase with the return of the Doctor to our screens in 2010," she stated. Dropping a planned Dalek cover in favour of a striking image from John's upcoming graphic novel, 2000AD co-creator Pat Mills pays tribute to the controversial but never dull Judge Dredd artist, while Jody Kihara shares her thoughts on the sad passing of Peter O'Donnell. Despite such downbeat items, both fitting tributes to the creators, Crikey! overall has plenty to celebrate, not least of which is a rare interview with veteran cartoonist Peter Maddocks, who now lives in Malaga. The artist talks extensively about his career, which includes his time as cartoon editor of Lord Beaverbrook's newspapers, which included nursing the early development of the James Bond newspaper strip, and his own strips such as Four D Jones. It's an informative piece (despite requiring just a touch more copy editing, perhaps) and a welcome insight into newspaper strip cartooning, all too rarely covered by comics magazines. Equally enjoyable is David Slinn's continued look at all things Eagle, which provides an informative overview of the much-loved weekly's early days; while Tony Ingram takes a look at the 1980s Eagle, another title rarely given much coverage despite its huge following. All in all, this is another fine issue and fully deserving the support of downthetubes readers. Recommended. Last weekend’s London MCM Expo was the most successful in the show’s history, with more than 41,000 visitors attending over the two days. Already established as the top UK entertainment event, the show organisers say the Expo has grown over the past few years to become Europe’s answer to the San Diego Comic Con, with hundreds of exhibitors including major movie studios, acclaimed comic artists and world famous game developers. Special guests from the world of film and TV at this May’s event included Caprica’s Ron D Moore and Esai Morales; the cast and crew of the BBC’s hit fantasy series Merlin and new horror drama Pulse; Stargate Universe’s Alaina Huffman and Jamil Walker Smith; Fringe’s John Noble and Jasika Nicole; Wizards of Waverly Place star David DeLuise; King of the Hill and Sister Act star Kathy Najimy; top voice artists Kyle Hebert, Yuri Lowenthal and Tara Platt, and the team behind upcoming feature-length animation Ultramarines. In addition, the Expo crowds were entertained by live sets from Starman, the fivepiece made famous by SKY1 show Pineapple Dance Studios, and British J-pop artist Bentley Jones, while visitors to the popular Comic Village met with a host of professional comics stars and indie talent, including Warren Ellis; Ben Templesmith; Jamie McKelvie; Kieron Gillen and Paul Cornell. Elephantmen creator Richard Starkings was also at the event to talk about the new film based on his smash-hit comic universe, revealing he wants a hard edged SF tale to result. "I had offers for standard cell animations, but I didn't want it to be dumbed down," he told Digital Spy. "I wanted it presented as a heavy, science fiction, futuristic, dark fantasy. "It's in my contract that I get to write the story treatment. I didn't really want to write a screenplay because I'm so involved with putting out the comic book and I didn't want it to slow me down." Meanwhile, the games presence at Expo has continued to go from strength to strength, with top publishers such as Nintendo, Activision, Namco Bandai, Tecmo Koei, Ubisoft and Rising Star Games all present. The weekend also saw Konami crown winners at its national Yu-Gi-Oh! TCG and DS National Championships as well as Turtle Entertainment host a series of professional gaming tournaments as part of the Electronic Sports League’s UK Pro Series. Oh, and there was the little matter of setting a new Guinness World Record, with gamers gathering to participate in what is officially the largest handheld game console party ever! Visitors to the show were also treated to some amazing cosplay. The inaugural UK Euro Cosplay Qualifiers showcased some truly fantastic outfits, while our Cosplay Masquerade once again proved a hit with the many cosplayers who came along - and they'll be back again for the Euro Cosplay finals at October’s MCM Expo. Other popular attractions included all the UK’s major anime distributors; an exhibition by the Victorian Steampunk Society; the JapanEX area, which gave visitors the chance to sample Japanese culture and lifestyle; and an exciting series of matches arranged by FWA Wrestling.